Looking for ideas for a splashy New Year’s nosh? Here are my biased prerequisites regarding what an appetizer/finger food should accomplish to guarantee it is admired and then devoured at a party. 1. Said appetizer is visually appealing; the more it looks like a fancy wrapped present, the more it will be appreciated. 2. When I say finger food, I mean finger-thumb food. One should be able to eat the appetizer using their forefinger and thumb. The other hand has its own job — clutching the stem of a wine glass or champagne flute insuring it’s at the ready, at all times. 3. The tantalizing morsel may be consumed in one bite and does not require a plate. A napkin, perhaps, but no plate. A plate requires two hands and one of the hands has its own responsibilities (see #2). 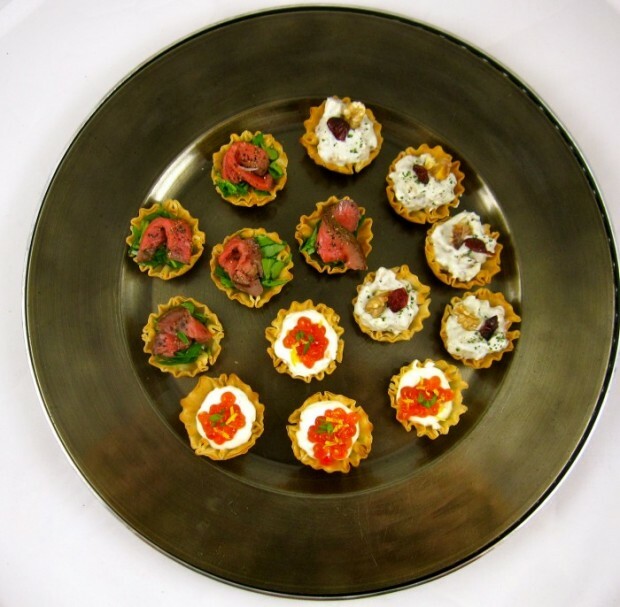 If you were one of those kids admonished for playing with your food, you will love fussing with canapé preparation. If swatches of fabric are tucked into your wallet in case you happen upon decorative accents that would coordinate with your color scheme, you may already have an arsenal of canapé recipes. However, if you’re strictly a meat and potatoes person whose furnishings sole objective is of function and convenience, you may not get it. Indeed, I doubt you’ve read this far. Partially freezing meat before slicing makes trimming meat to thin slivers a cinch. Some of the ingredients in the following recipes are pricey, to be sure; however, only tiny bits of the precious gems are required. For example, to make my Truffled Fillet and Watercress canapes, I used a half of a leftover filet mignon from the previous night’s dinner. That piece yielded more than two dozen canapés. I have a small bottle of white truffle oil, purchased for $10 from Fustini’s in Kerrytown, which comes equipped with an eyedropper so nary a drop is wasted. I used less than 3 tablespoons of salmon roe, which I purchased in the seafood department at Hiller’s. The canvas for your chef’s d’oeuvres can be made from day-old bread, thinly sliced and cut into various shapes; they could be toasted or not. For ease, I always use pre-made phyllo or puff pastry shells, which may be found in the frozen section at most groceries in town. I used Athens Mini Fill Shells (15 to a box), which I purchased at Hiller’s. It’s easy to make your own creme fraiche, but I saved time by using pre-packaged Vermont Creme Fraiche, which is quite good. Whether you welcome 2012 with canapés and champagne or potato chips and Coke, let the good times roll. Happy New Year! 15 slivers rare beef, cut into pieces 2-inches long by 1/2-inch wide by 1/8-inch thick. Season beef with kosher salt and pepper, if needed. Whisk together 1 1/2 tablespoons truffle oil with 1 teaspoon vinegar. Let beef marinate at least 2 hours and up to 48 hours refrigerated in mixture. Whisk together remaining tablespoon truffle oil with remaining teaspoon of sherry vinegar. Toss with watercress ribbons and season with kosher salt and freshly ground pepper. Fill canapés with ribbons, top with beef sliver and garnish with a bit of freshly ground pepper. Mix scallions and zest with creme fraiche; combine well. Place heaping 1/2 tablespoon of the creme fraiche mixture in each shell. Top with 1/2 teaspoon roe and garnish each canape with a small amount of scallion and zest. Mix cheeses with pear and walnuts; combine well. Fill each shell with mixture. Sprinkle a tiny bit of parsley over each canapé, then garnish with a piece of walnut and a cranberry. More Recipes Filed Under "All Appetizers"
Hi admin, i must say you have very interesting content here. Your blog should go viral. You need initial traffic only. How to get it?